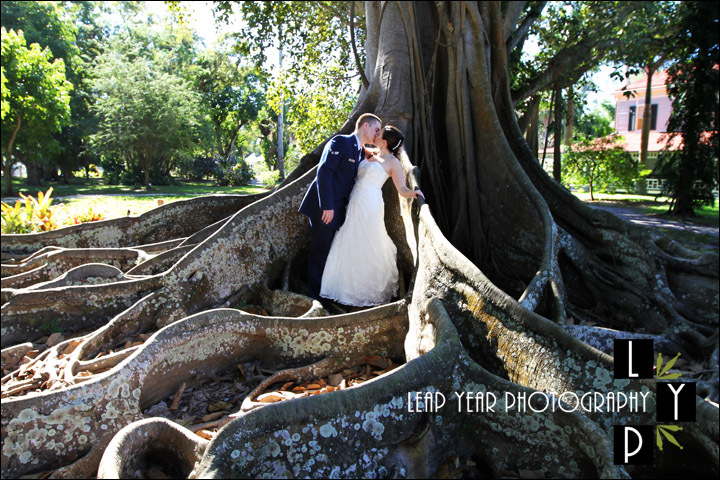 The Edison & Ford Winter Estates is a timeless venue for wedding photography in Fort Myers. 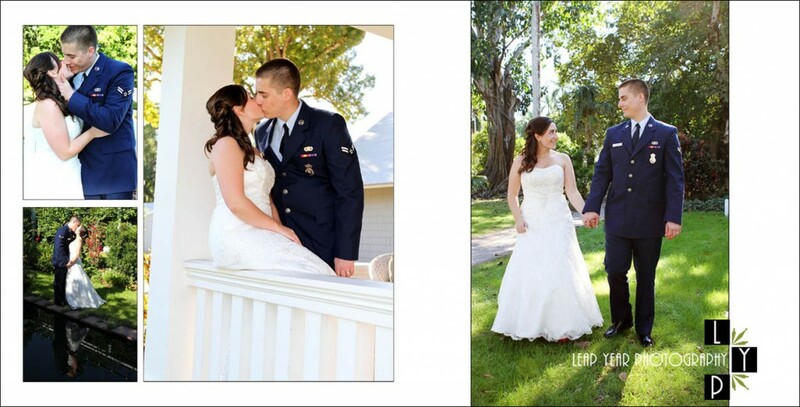 There’s something so simple, yet elegant, about the romantic gardens, beautiful Caloosahatchee River views, the historic Edison Ford homes and numerous outdoor wedding ceremony locations. It’s one of the few venues that is able to transport you to a time in Fort Myers’ historic past and Olde Florida. To a time when the photograph and the phonograph were the latest technologies. With the exception of the Caretaker’s House, we walked (and rode in a golf cart) to just about every location the Edison and Ford Winter Estates had to offer. All of these locations including: Mina’s Moonlight Garden, Edison’s Coconut Grove, Ford’s Riverside Lawn, and Royal Palm Alleé, make for wonderful wedding photographs. While we frequently see the bride and groom head directly to the central Mysore Fig Tree as their photographic wedding backdrop, we took Brittany and Ryan to giant Fig tree nestled in Edison’s Garden as you’ll see in the photos below. Located at 2350 McGregor Boulevard Fort Myers, FL 33901, the Edison & Ford Winter Estates offers acres of historical buildings, historic gardens, the Edison Botanic Research Lab and the Edison Ford Museum. However, nothing is more memorable than your own wedding at the site. 2017 post Hurricane Irma update: The large Mysore Fig tree seen in these photos was downed during Hurricane Irma. We’re glad we were able to enjoy it during our numerous weddings and photo shoots at the Estates. Will you be getting married at the Edison & Ford homes? Using classic wedding photography, contemporary and photojournalism, Leap Year Photography will capture your wedding in Style! Contact Leap Year Photography to provide photography for your wedding day. 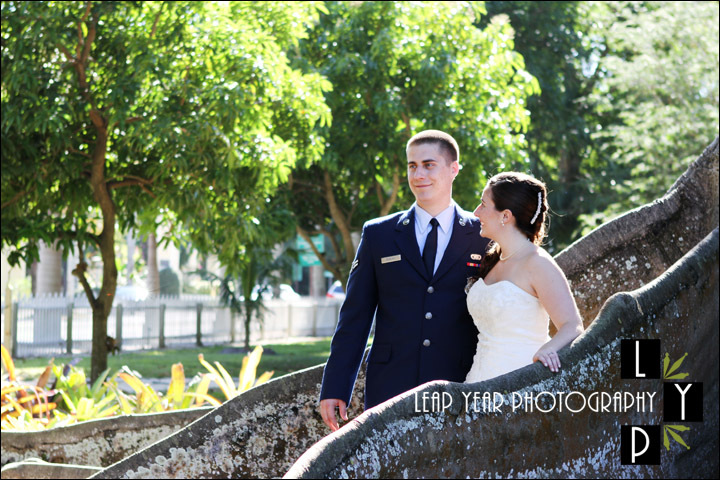 Leap Year Photography’s Fort Myers Photographers can provide all of your Wedding Photography needs! This entry was written by Erin, posted on October 29, 2017 at 6:17 pm, filed under Wedding and tagged Edison & Ford Winter Estates Wedding, Edison & Ford Winter Estates Wedding Photography, fort myers wedding photographers, Post Hurricane Irma update. Bookmark the permalink. Follow any comments here with the RSS feed for this post. Post a comment or leave a trackback: Trackback URL.